Not much to say about Saturday’s loss in Pittsburgh, other than it’s another quality start for Ryan Vogelsong. So, with the Giants in Pittsburgh this weekend, it’s seems like the right time to send a big thank you to Freddy Sanchez. Thanks, Freddy, for the 2010 season and the World Series championship. That’s about all the Giants got for the more than $18 million they spent on Sanchez since aquiring him during the 2009 season. For most of us, that was enough. In a way, it was like the money we spent on Edgar Renteria, the money we’re still spending on Aubrey Huff. Really expensive lightning in a bottle. Sanchez’s bid to return to the Giants this season ended Thursday when the team announced the second baseman would require back surgery. So thus ends the Freddy Sanchez era, in all probability, in San Francisco. He won’t be back this season. Maybe he won’t be back at all, for the Giants or anyone else. On July 29, 2009, the Giants acquired Sanchez in a trade with the Pirates for pitching prospect Tim Alderson. A couple weeks earlier, Sanchez had been the Pirates’ All-Star representative. Well, as it turns out, I was right about the first two points, wrong on the final one. Sanchez was worth giving up Alderson, who has barely made it above Double-A since joining the Pirates organization. In what basically amounted to a little less than two seasons of playing time with the Giants, Sanchez hit .290 with 11 HRs, 78 RBI in 196 games. Sanchez only played 25 games for the Giants in 2009, spending a stint on the DL with a strained left shoulder. That offseason, facing a decision on whether or not to pick up Sanchez’s team option in 2010, the Giants signed him to a two-year, $12 million contract. Later that offseason, Sanchez had surgery on that left shoulder, but hopes were that he’d be ready for the 2010 opener. He did not return until May 19. But after that, he played in 111 games, hitting .292 with 7 HRs and 47 RBI. After slumping in the NL Division series against the Braves, he hit .320 in the NLCS vs. the Phillies and .273 in the World Series vs. the Rangers. He became the first player to double in his first three World Series at-bats. Sanchez strained his left shoulder again late in the 2010 season, but played through it. He had another procedure on the shoulder after the 2010 season, but started the 2011 season on time. During the season-opening series in Los Angeles in 2011, the Giants announced they were extending Sanchez’s contract by one more year for $6 million. It was a puzzling move because it came so early in the season, especially given Sanchez’s history with injuries. He hit .289 with 3 HRs and 24 RBI in 60 games in 2011 before dislocating his right shoulder while attempting to make a diving stop at second base against the Reds on June 10. He had season-ending surgery two months later. Sanchez came to spring training this year hoping to be ready to play by the time games started. But a back issue delayed his recovery. After returning to the field, Sanchez was not able to develop the arm strength to start the season with the Giants, and he remained in Arizona for extended spring training. He began a minor-league rehab stint with the San Jose Giants on April 23, going 4 for 10 in three games. But that ended when his shoulder stiffened up. He returned to Arizona to work on his shoulder strength when his back flared up in mid-May. Now, the Giants are left to decide what their future is at second base. Ryan Theriot (.280) has done a solid job after spening 15 days on the DL in late May. Joaquin Arias (.244) and Emmanel Burriss (.210) are the other options. If there’s a silver lining, Sanchez’s surgery does open up a spot on the Giants’ 40-man roster if they want to see if anyone down on the farm could give the Giants boost at second base. Brock Bond (age 26) — 1 HR, 19 RBI, .332 AVG, .406 OBP in 56 games with Triple-A Fresno. Bats right. Nick Noonan (age 23) — 3 HR, 38 RBI, .297 AVG, .357 OBP in 78 games with Triple-A Fresno. Bats left. Playing SS for Grizzlies. Charlie Culberson (age 23) — 7 HR, 46 RBI, .251 AVG, .292 OBP in 74 games with Triple-A Fresno. Bats right. Had a brief stint with Giants earlier this year, going 3 for 22 (.136) in six games. On 40-man roster. Bobby Haney (age 23) — 0 HR, 10 RBI, .322 AVG, .359 OBP in 35 games with Class-A San Jose. Bats left. Joe Panik (age 21) — 4 HR, 44 RBI, .263 AVG, .339 OBP in 82 games with Class-A San Jose. Bats left. First-round pick in 2011. Playing SS in San Jose. Among potential free-agent second baseman this offseason includes Orlando Hudson (White Sox), Maicer Izturis (Angels), Jeff Keppinger (Rays), Marco Scutaro (Rockies), Placido Polanco (Phillies), Kelly Johnson (Blue Jays) and Skip Schumaker (Cardinals). So let’s take a look at the players the Giants have tried at second base this season. All of that has added up to 0 HR, 6 RBI, .208 AVG, .259 OBP, .216 SLG. In case you haven’t figured it out, that’s the worst for any position other than pitcher on the team. Even Giants shortstops are hitting .240. In fact, Giants pitchers have delivered two more doubles than second basemen. With that as a backdrop, we share news Monday that Freddy Sanchez had ANOTHER setback on his recovery from shoulder surgery. Except this time, it was his back that flared up. Manager Bruce Bochy called it a “minor setback.” But no setback for Sanchez can be consider “minor” at this point. Plus, Sanchez battled a sore back when he started spring training in Arizona. Bochy said earlier this month that there was 50-50 chance of Sanchez returning to the Giants by the end of the month. Those odds went WAY down after Monday’s news. In fact, if you had “September 1 to never” in your office pool on Sanchez’s return date, you’re looking good right now. So where do the Giants’ go from here? Well, in the short term, they’ll turn to Charlie Culberson. Culberson went 1 for 5 in his big-league debut Sunday after getting a late call Saturday for a promotion. 3B Conor Gillaspie was sent down. Culberson is a 23-year-old who was a sandwich pick out of high school in 2007. The Giants started him out as a shortstop. But after committing 35 errors in 79 games at Class A Augusta in 2008, they moved him the third base. But he maded 40 errrors in 132 games there for Augusta in 2009. That led to a move to second base, where he found success. Coincidentally (or not), once Culberson found a defensive position, his offensive numbers improved. 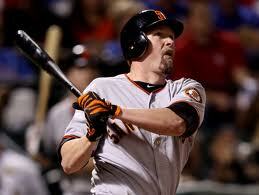 After hitting .234 in 2008 and .246 in 2009, he hit .290 with 16 HR, 71 RBI for Class A San Jose in 2010. He followed that up with 10 HR, 56 RBI and .259 at Double-A Richmond in a league that usually challenges hitters. He was hitting .284 with 5 HR and 24 RBI, plus 11 doubles for Fresno. It’s that show of power that led the Giants to call on Culberson over the more experienced Brock Bond, who was hitting .380 with a .450 OBP for Fresno. But the 26-year-old Bond had 1 HR and 11 RBI. But we’ve seen players who were hitting at Fresno come to San Francisco and failed to get the job done. That was the case with Gillaspie, who was sent down as much for his defense as his offense. So we’ll see what Culberson can do. After anguishing through an inning of watching Aubrey Huff play second base, Giants fans got some good news on Sunday. Freddy Sanchez will make his 2012 debut by starting a minor-league rehab assignment with the Class A San Jose Giants on Monday. The last we saw Sanchez he was taking infield practice during the season-opening series in Arizona, by all accounts, looking better than he has all spring. We had hoped that would lead to a rehab assignment. But it didn’t, and that was two weeks ago. Then we heard the Giants wanted to start his rehab outing last Tuesday. But that got delayed to Thursday. When that didn’t happen, manager Bruce Bochy said he didn’t when Sanchez would be playing games. Finally, the news came Sunday that Sanchez was headed to San Jose. He’ll play a couple games as a designated hitter before taking to the field by Wednesday. Or at least that’s the plan. By rule, Sanchez can spend no more than 20 days on the assignment, meaning the Giants must activate him no later than May 13. Bochy said the Giants have Sanchez mapped out to spend 18 days in the rehab assignment, but he could return soon. If stays on the 18-day plan, it would mean he’s scheduled to make his 2012 on May 11 at Arizona. Well, it was hardly breaking news, but in Tuesday’s ESPN2 broadcast of the Angels-Giants game Giants manager Bruce Bochy announced that second baseman Freddy Sanchez would open the season on the disabled list. Sanchez has been idle since receiving a cortisone shot in his troublesome shoulder on Sunday. The Giants hope Sanchez can resume light throwing by mid-week. He was getting at-bats as a DH in a minor-league game on Wednesday. But until he can show he can make all throws necessary to play second base, he won’t be playing for the Giants. Bochy said Tuesday that he’s hoping Sanchez can be ready to play for the Giants “sometime in April.” But at this point, we’re not really sure he’ll return at all. The Giants have said Sanchez’s rehab from shoulder surgery last year has hit a plateau. They hope the cortisone shots will be the spark that will Sanchez to push through this plateau and get back on the road to recovery. In the meantime, it looks as if Emmanuel Burriss is the front-runner to win the start at 2B on April 6. Mike Fontenot and Ryan Theriot are also in the mix. The Giants face a Thursday deadline to guarantee deals for Fontenot and Theriot. It looks as if they will do just that. Theriot was hit on the nose with a pickoff throw on Monday. Yet, he is starting at 3B against the Dodgers on Wednesday. If the Giants were thinking of releasing Theriot on Thursday, it would figure they wouldn’t bother playing him Wednesday. What can he show them in two days that they haven’t seen already. But given the uncertainty of Sanchez, the veteran presence of Theriot (plus his right-handed bat) is something the Giants aren’t likely ready to part with. This isn’t the start he was looking for, but it looks as if Ryan Vogelsong will make his second opening-day start for the Fresno Grizzlies. After making his spring debut with a 39-pitch outing against the Royals on Monday, Vogelsong will pitch in a minor-league game Saturday so that the Giants can start the clock on his 15 days on the disabled list to open the season. The plan is for Vogelsong to be ready to open the season on April 15 against the Pirates. To get there, Vogelsong will start the season opener for Triple-A Fresno at Tucson on April 5. His next start for the Grizzlies would come on April 10 at Las Vegas. Sunday, April 8: Matt Cain vs. Josh Collmenter, 1 p.m.
Those are three right-handers for Arizona. 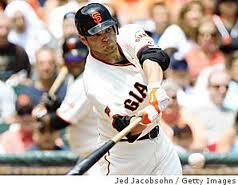 Good news for Giants, who figure to open with a lineup that will include four switch hitters (Angel Pagan, Melky Cabrera, Pablo Sandoval and Emmanuel Burriss) and three left-handers (Brandon Crawford, Aubrey Huff or Brandon Belt, and Nate Schierholtz or Gregor Blanco).